A group of ten Ulster Grand Prix newcomers joined Clerk of the Course, Noel Johnston and MCUI instructors, Stephen Ferguson and Michael Swann for an information briefing at Dundrod. Ten newcomers hoping to compete at this year’s MCE Insurance Ulster Grand Prix have taken part in a special safety briefing at Dundrod. The group of competitors hailed from the UK, Ireland, France and the Netherlands and participated in an information session led by Clerk of the Course Noel Johnston, who was assisted by MCUI accredited trainers Michael Swann and Stephen Ferguson. 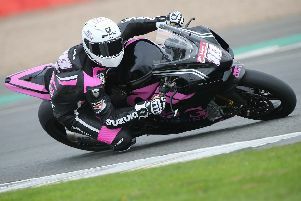 The event, which was funded by Lisburn & Castlereagh City Council, was aimed at giving the riders an insight into what they can expect when they compete in the ‘World’s Fastest Road Race’ in August. The newcomers in attendance included Marc Antoine (France), Eoin O’Siochru (Ireland), Ryan Dixon (England), Stephen Degnan (England), Craig Neve (England), Nadieh Shoots (Netherlands), Jamie Williams (Isle of Man), Mike Norbury (England), Paul Williams (England) and Don Gilbert (England). Race chief Johnston said: “The Dundrod circuit is technical, it’s fast and it demands respect. Even the most experienced riders, who are regular visitors to Dundrod, understand how imperative it is that they re-familiarise themselves with the circuit each time they visit. “We have made significant changes to the event this year, both to ensure continued growth and to enhance safety. Under these changes attendance at this information session by those new to the race has been made compulsory. “If they wish to compete they need to do their homework,” he added. Johnston expressed his thanks to Lisburn & Castlereagh City Council for funding the initiative. “On behalf of the Ulster Grand Prix, I would like to extend our thanks to Lisburn & Castlereagh City Council for supporting our firm stance on safety and for subsequently providing the funding required to bring these riders over,” he said. The event will take place this summer from August 5-11. Tickets are on sale now via www.ticketmaster.ie.